2001-04-02 Assigned to AON NETWORKS, INC. reassignment AON NETWORKS, INC. ASSIGNMENT OF ASSIGNORS INTEREST (SEE DOCUMENT FOR DETAILS). Assignors: BAMBOS, NICHOLAS, FARMWALD, PAUL M., BROCH, JOSHUA G., DUNN, P. BRADLEY, FURMAN, ELLIOT M., MALTZ, DAVID A. 2003-11-06 Assigned to SKYMOON RESEARCH AND DEVELOPMENT, LLC reassignment SKYMOON RESEARCH AND DEVELOPMENT, LLC ASSIGNMENT OF ASSIGNORS INTEREST (SEE DOCUMENT FOR DETAILS). Assignors: AON NETWORKS, INC. The preferred embodiments described herein provide a method and system for automatically directing data in a computer network based on traffic demands. In one preferred embodiment, traffic demands of a computer network are determined, and data is automatically directed in the computer network based on the determined traffic demands. Other preferred embodiments are provided, and any or all of the preferred embodiments described herein can be used alone or in combination with one another. This application claims the benefit of U.S. Provisional Application No. 60/251,811, filed Dec. 7, 2000, which is hereby incorporated by reference. By way of introduction, the preferred embodiments described herein provide a method and system for automatically directing data in a computer network based on traffic demands. In one preferred embodiment, traffic demands of a computer network are determined, and data is automatically directed in the computer network based on the determined traffic demands. Other preferred embodiments are provided, and any or all of the preferred embodiments described herein can be used alone or in combination with one another. The preferred embodiments will now be described with reference to the attached drawings. Turning now to the drawings, FIG. 1 is an illustration of a computer network  100 of a preferred embodiment comprising a plurality (here, seven) of locations 110, which are also known as Points of Presence (POPs) or nodes, each comprising at least one network element. As used herein, the term “network element” is intended to broadly refer to any device that connects to one or more network elements and is capable of controlling the flow of data through the device. Examples of network elements include, but are not limited to, routers, optical routers, wavelength routers, label switched routers (LSR), optical cross-connects, optical and non-optical switches, Synchronous Optical Network (SONET) Add-Drop Multiplexers (ADMs), and Asynchronous Transfer Mode (ATM) switches. The data exchanged between nodes is preferably in digital form and can be, for example, computer data (e.g., email), audio information (e.g., voice data, music files), and/or video information, or any combination thereof. Data, which is also referred to as network traffic, is communicated between the nodes  110 of the network 100 via a path. As used herein, the term “path” is intended to refer to the way in which data is directed through one or more network elements. A path can, for example, be represented by protocol labels, such as those used within the Multi-Protocol Label Switching (MPLS) framework (used on Packet-Switch Capable (PSC) interfaces), time slots (used on Time-Division Multiplex Capable (TDMC) interfaces), wavelengths (used on Lambda Switch Capable (LSC) interfaces), and fibers (used on Fiber Switch Capable (FSC) interfaces). 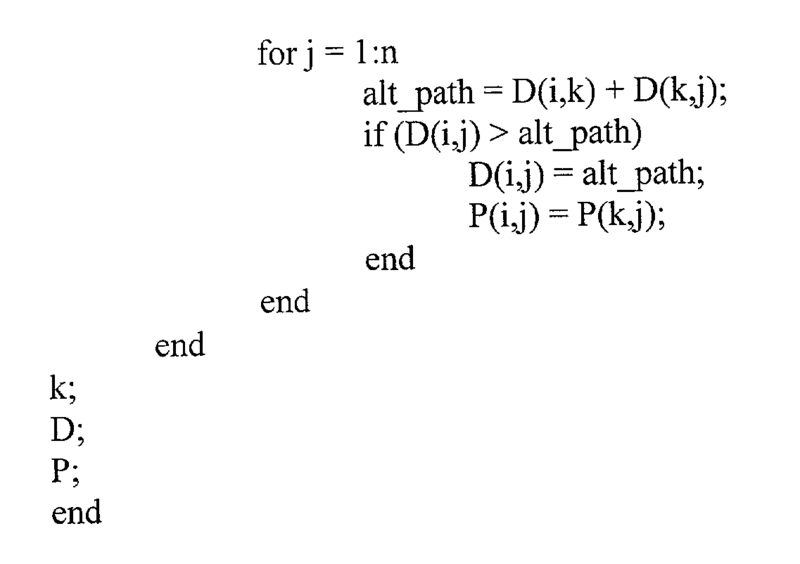 Paths can have other representations. Accordingly, a path can be an explicit labeling of the traffic (e.g., Label Switched Paths (LSPs)), the creation of a forwarding schedule in the network elements (e.g., a Time Division Multiplexing (TDM) switching table), and lightpaths. For simplicity, the network used to illustrate these preferred embodiments has a fixed physical connectivity (topology), and the path between nodes takes the form of label-switched paths (LSPs). 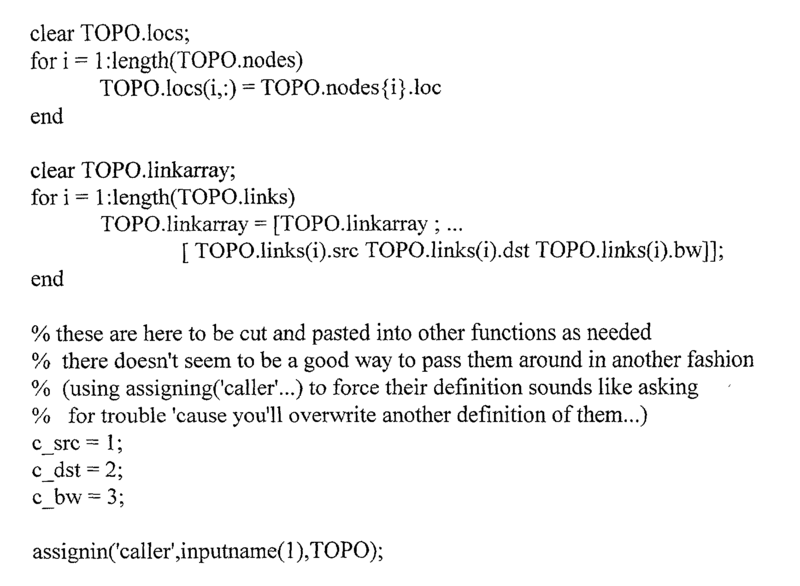 Of course, other network topology and provisioning systems can be used, and the claims should not be read to include these elements unless these elements are explicitly recited therein. FIG. 1 shows the nodes  110 of the network 100 coupled with a network (traffic) management system 120. As used herein, the term “coupled with” means directly coupled with or indirectly coupled with through one or more named or unnamed components. In this preferred embodiment, the traffic management system 120 automatically directs data in the computer network 100 (e.g., automatically provisions paths through the network) in response to traffic demands. As used herein, the term “automatically” means without human intervention (e.g., without the intervention of a network operator). Traffic demands can be determined by observations of existing traffic patterns and/or by explicit user requests to the network via a User-Network-Interface (UNI) (e.g., Optical Network Interface, OIF 2000.125). Traffic demands can also be determined by predicting future traffic patterns based on observed traffic patterns or on notification of traffic demands via a policy system such as the Common Object Policy Service (COPS). One or more ways of determining traffic demands can be used. Although not required, the traffic management system can monitor the traffic patterns in the automatically-provisioned path and automatically provision yet another path based on the monitored traffic demands. This provides a feedback functionality that repeatedly and dynamically provisions paths in the network. Turning again to the drawings, FIG. 2 is a block diagram of one presently preferred embodiment of the traffic management system (TMS). In this preferred embodiment, the traffic management system comprises a TMS Algorithm  200. The TMS Algorithm 200, which can be implemented with hardware and/or software, receives inputs that represent the traffic demand on the network 210. With these inputs and with knowledge of network topology and policy information, the TMS Algorithm 200 outputs network element configurations to automatically direct data based on the traffic demand. For example, the TMS can collect traffic information from all edge routers and switches in the network 210, predict bandwidth needs throughout the network 210, and send control information back to the network elements to reconfigure the network 210 to alter the forwarding of data so that network resources are better utilized (i. e., optimally utilized) based on the traffic demand on the network 210. As shown in FIG. 2, one input to the TMS Algorithm  200 can be explicit allocations requests 220 made by customers of the operator's network 210 and/or service level agreements (SLAs) 230. Examples of methods for requesting service include the User Network Interface defined by the Optical Internetworking Forum (OIF) and the Resource Reservation Protocol (RSVP) defined by the Internet Engineering Task Force (IETF). The COPS system, also defined by the IETF, enables the carrier to enter into a database the policies the carrier wants enforced for the network. Some classes of these policies specify services the network should provide, and so these policies reflect the requests for service made to the carrier and can be treated by the TMS as requests for service. In many situations, however, there will not be an explicit request made for service for some or all of the data carried by the network. In these cases, the traffic demand is determined by observation of the existing traffic or statistics and/or predictions of future traffic demand based on those statistics. FIG. 2 shows traffic predictions and/or statistics being provided to the TMS Algorithm 200 through a component labeled TMS Statistics Repository 240 and shows network element configurations being outputted through a component labeled TMS Signaling System 250. It should be noted that the input and output of the TMS Algorithm 200 can be received from and provided to the operator's network 210 without these components, which will be described in detail below. FIG. 3 provides an illustration of one presently preferred implementation of a traffic management system. As shown in FIG. 3, the operator's network comprises a plurality of network elements  303 located at Points of Presence (POPs) or nodes 300, 301, and 302. In the embodiment shown in FIG. 3, there are three routers R in each of the three POPs 300, 301, 302. It should be understood that a network can have more or fewer network elements and POPs and that the network elements are not necessarily routers. In this preferred embodiment, the traffic management system comprises a number of sub-systems: a plurality of TMS Statistics Collection and Signaling Servers 304, 305, 306, a TMS Statistics Repository 310, a TMS Algorithm 320, and a TMS Signaling System 330. It should be noted that while each TMS Statistics Collection and Signaling Server 304, 305, 306 is shown as a single entity, the TMS Statistics Collection and Signaling Server 304, 305, 306 can be implemented as two separate entities: a statistics collection server and a signaling server. While the TMS Statistics Collection and Signaling Servers 304, 305, 306 will be described in this section as one entity that performs both the statistics collection and signaling functions, in other sections of this document, the statistics collection and signaling functionality is distributed between two or more servers. Also, while FIG. 3 shows the TMS Statistics Collection and Signaling Servers 304, 305, 306 distributed throughout the network with one TMS Statistics Collection and Signaling Server 304, 305, 306 located at each POP 300, 301, 302, other arrangements are possible. Each TMS Statistics Collection and Signaling Server  304, 305, 306 connects to the network elements (in this embodiment, routers R) within its local POP and collects and processes traffic data from the network elements. This information is fed back through the network to the TMS Statistics Repository 310, where the information is stored. The TMS Algorithm 320 processes the collected statistics stored in the TMS Statistics Repository 310 and determines the optimal network configuration. As mentioned above, the TMS Algorithm 320 can operate with traffic for which a request for service has been made in addition to traffic offered without a request by adding the requested demands to the demand determined by observing the pattern of traffic that is not covered by a request. Communication with the TMS Statistics Repository 310 can be via an “out-of-band” communication channel, or alternatively, an in-band channel within the network. Once the TMS Algorithm 320 determines the optimal network configuration, the TMS Signaling System 330 sends the optimal network configuration to each TMS Statistics Collection and Signaling Server 304, 305, 306 by generating the appropriate configuration information for each network element (in this embodiment, the routers R) and distributes this information to each TMS Statistics Collection and Signaling Server 304, 305, 306. The TMS Statistics Collection and Signaling Servers 304, 305, 306 then distribute this information to their respective routers R, thereby allowing the optimal network configuration determined by the TMS Algorithm 320 to be implemented. FIG. 4 is a flow chart showing the chronological operation of the Traffic Management System of FIG. 3. First, the TMS Statistics Collection and Signaling Servers  304, 305, 306 instruct the routers R to collect specific traffic information (act 400). The TMS Statistics Collection and Signaling Servers 304, 305, 306 receive traffic information from the routers R (act 410) and process the traffic information (act 420). The TMS Statistics Collection and Signaling Servers 304, 305, 306 then send the information to the TMS Statistics Repository 310 (act 430). The TMS Algorithm 320 creates a traffic demand matrix using information stored in the TMS Statistics Repository 310 (act 440) and uses the traffic demand matrix to determine an optimal network configuration (act 450) in conjunction with the Network Topology Information. The TMS Signaling System 330 receives the network configuration from the TMS Algorithm 320 (act 460). After the TMS Statistics Collection and Signaling Servers 304, 305, 306 receive the network configuration from the TMS Signaling System 330 (act 470), the TMS Statistics Collection and Signaling Servers 304, 305, 306 configure each router R as appropriate (act 480). When the configuration is done (act 490), the TMS Statistics Collection and Signaling Servers 304, 305, 306 again receive traffic information from the routers R (act 410), and the process described above is repeated. As described above, one feature of this system is the real-time feedback loop. Measurements/statistics collected from the network (in addition to specific SLAs or requests from users) are repeatedly analyzed by the TMS Algorithm  320, which then adjusts the network configuration. The actual running of the TMS Algorithm 320 can be periodic (as shown in FIG. 4), or it can be event driven (e.g., when a new SLA is added to the system). Table 1 shows an example of the type of data in the records obtained from the network elements by the TMS Statistics Collection and Signaling Servers 304, 305, 306. FIG. 5 shows one instance of how the TMS Algorithm  320 can be implemented. The algorithm is run every ΔT time period where ΔT is chosen such that it is greater than the time required to collect traffic information, process it, find new paths, and send control information to the routers or switches. The result of the algorithm's execution is a series of paths (P) that is to be set up to allow the predicted traffic to flow. In practice, the algorithm does not necessarily need to be periodic, and in fact can be triggered, for example, by a sufficiently large change in the traffic patterns. Every time period, the algorithm, using traffic statistics collected from the network, determines all ingress-egress traffic flows, and uses this data to estimate the needed bandwidth during the next time period. The estimated bandwidth is also known as the traffic demand matrix, each element in the matrix representing the bandwidth demand between a network ingress point (in) and a network egress point (out). In act  501, the demand matrix is computed by taking the mean and variation of the traffic demand over the previous ten time periods and predicting the demanded traffic Din,out as the mean plus three times the standard deviation. Other methods may be used such as using maximum load over observation period, max+variance, mean+α*variance, projected trend, or mean. 1/(C 1,j−Din,out) is the inverse of the link capacity minus the bandwidth requirement (demand) of the flow, F.
In act  507, a weight matrix W is then instantiated, such that element (i,j) of the matrix W is Cost(i,j,F). 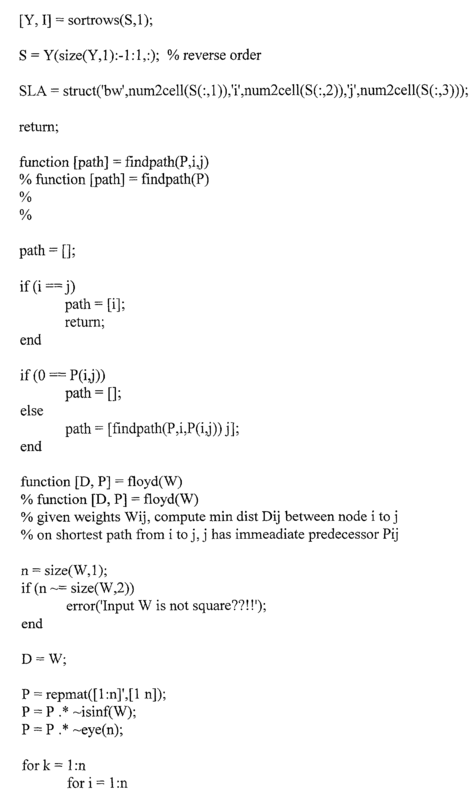 Wij is then used to determine how to route each flow (F), by running a single source shortest path search on W from the ingress point of F (in) to the egress point of F (out) (act 508). Single source shortest path searches are well understood by those skilled in the art. 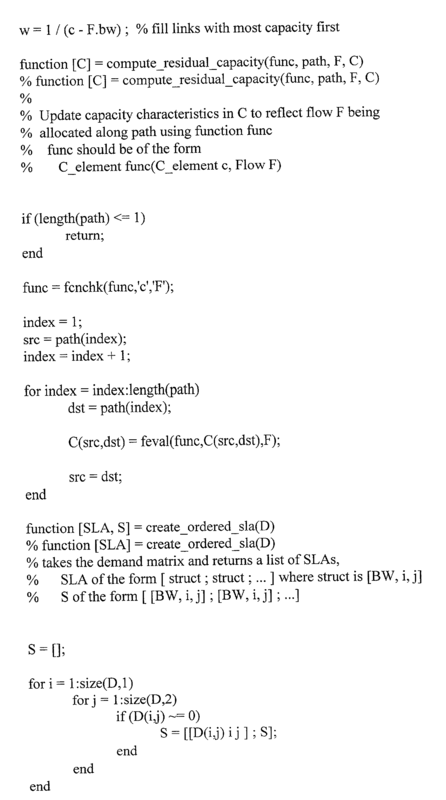 The result of this search is the path, P. The intermediate states are saved into an array of partial results (act 509), and the residual capacity for each link (act 510), Ci,j is computed by removing the traffic demand of F from links (i,j) along the shortest path P. That is Ci,j=C1,j−Din,out. Act  511 checks if all flows have been processed. If not, the next flow is popped off the stack and analyzed (act 504) as described above. Otherwise the algorithm waits for the end of the time interval, ΔT, and begins the entire network path optimization process again (act 501). It may be the case that there is a flow, F, that cannot be allocated a path because all possible paths in the network have been exhausted. In this case, the system can terminate and report the remaining flows that it is unable to allocate. In another embodiment, the system can backtrack to an earlier round, reorder the list, and resume running in order to find a more optimal solution. 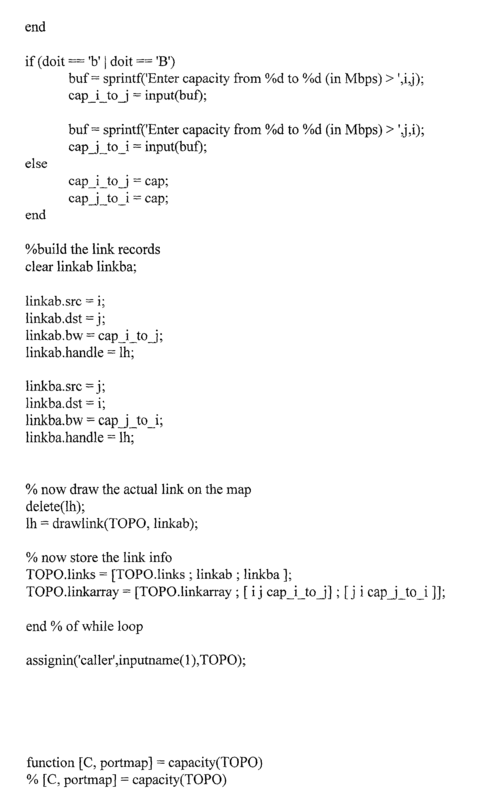 Earlier rounds are stored in the arrays SavedCapacity, AllocatedFlow, and ResultingPath (act 509). Other classes of algorithms are also suitable. Examples of such algorithms follow. 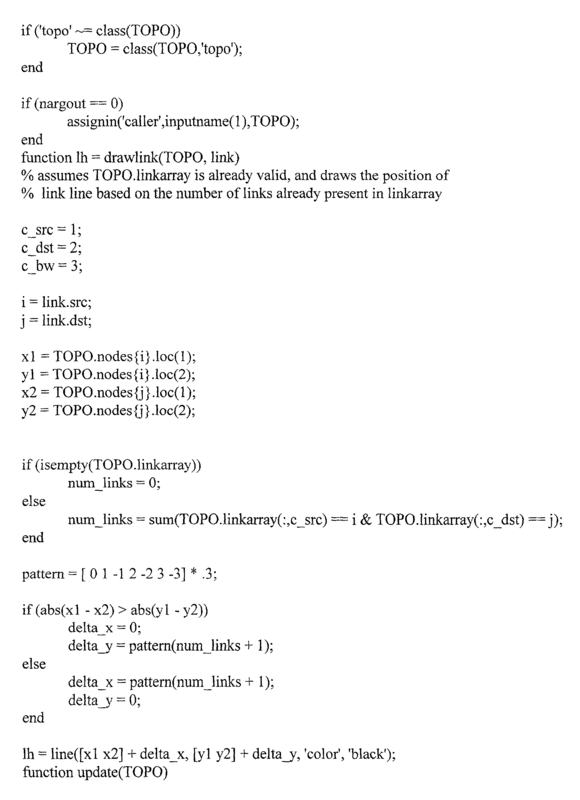 First, express the network optimization problem as a linear program where the traffic to be forwarded over each possible path through the network is represented as a variable (P1, P2, . . . Pn) for each path 1 to n. Constraint equations are written for each link to limit the sum of traffic flowing on the paths that traverse the link to the capacity of the link. 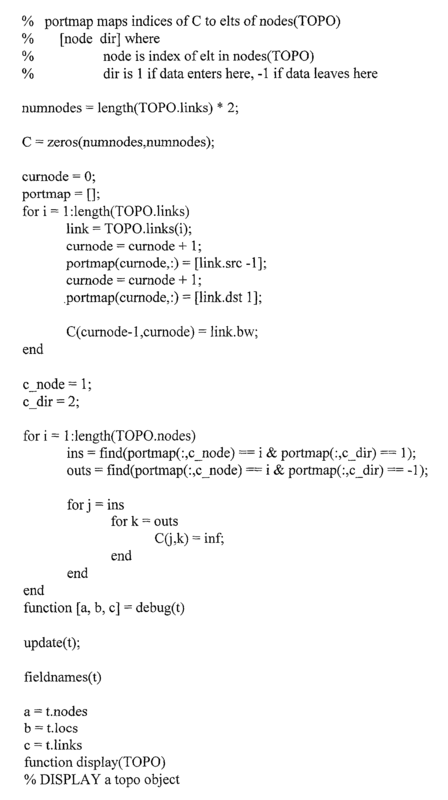 The objective function is written to maximize the sum of traffic along all paths. Solving such a linear program is a well known process. Second, represent the configuration of the network as a multi-dimensional state variable, write the objective function to maximize the sum of the traffic carried by the network, and use genetic algorithms to find an optimal solution. 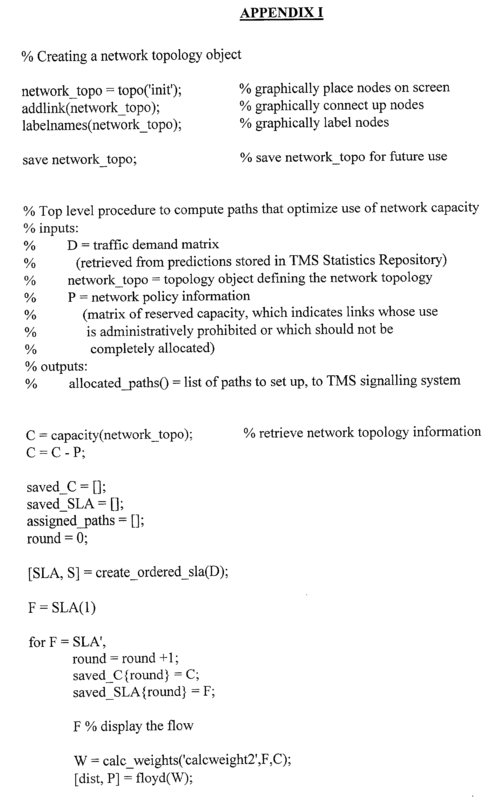 Techniques for representing a network as a state variable and the use of a genetic algorithm can be adapted by one skilled in the art from the method in  A Spare Capacity Planning Methodology for Wide Area Survivable Networks, by Adel Al-Rumaih, 1999, which is hereby incorporated by reference. Third, after representing the network as described in (2) above, using simulated annealing to find the optimal solution. For unprotected traffic, no additional steps are required by the TMS. For traffic demands resulting from a request for service requiring protection, the TMS Algorithm described above and in FIG. 5 is extended with the following steps. First, for a traffic flow requiring either 1:1 or 1+1 dedicated protection, one additional flow is placed on the stack in act  502, this flow having the same characteristics as the requested primary flow. The path that is eventually allocated for this additional flow will be used as the protection path for the requested flow. For traffic requiring N:M shared protection, M additional flows are placed on the stack in act 502, with each of the M flows having as characteristics the maximum of the characteristics of the requested N primary flows. 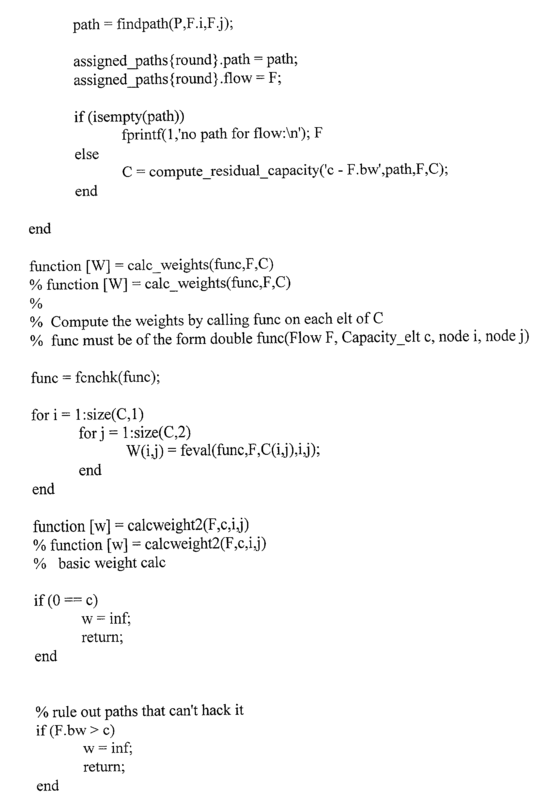 Second, the cost function, Cost(i,j,F), in act 506 is extended to return the value infinity if F is a protection path for a flow which has already been allocated a path, and that already allocated path involves either i or j. For Dedicated 1+1 protection paths, the TMS Algorithm must output to the TMS Signaling System not only the path, but also additional information in the common format which will cause the TMS Signaling System to command the ingress network element to duplicate the primary traffic onto the secondary protection path. For Dedicated 1:1 and Shared N:M paths, the TMS Algorithm can output to the TMS-SS additional information which will cause it to command the network elements to permit additional best-effort traffic onto the secondary paths. Turning again to the drawings, FIG. 6 is an illustration of one preferred implementation of this preferred embodiment. In this implementation, a plurality of POPs  600 in a computer network are coupled with a central TMS Statistics Repository 610 (the remote data storage device). Each POP comprises a respective TMS Statistics Collection Server 620 (the local processor) and a respective at least one network element (not shown). While a TMS Statistics Collection Server is shown in FIG. 6, it should be understood that the server can implement additional functionality. For example, as discussed above, the functionality of statistics collection can be combined with the functionality of the signaling in a single server (the TMS Collection and Signaling Server). In this preferred embodiment, the TMS Statistics Collection Server configures network elements to collect traffic information at its POPs, collects the traffic information, analyzes (e.g., processes, filters, compresses, and/or aggregates) the collected traffic information, and transmits a result of the analysis to the TMS Statistics Repository 610. Once the data is stored in the TMS Statistics Repository 610, it can be further analyzed, as described below. It should be noted that FIG. 6 may represent only a portion of an operator's network. For example, FIG. 6 could represent a single autonomous system (AS) or OSPF area. Data collected within this region of the network can be stored and processed separately from data collected in other areas. As described above, the TMS Statistics Repository acts as a collection or aggregation point for data from the TMS Statistics Collection Servers distributed throughout the network. FIG. 7 is an illustration of a TMS Statistics Repository  700 of a preferred embodiment. As shown in FIG. 7, the architecture of the TMS Statistics Repository 700 comprises a database 710 and a database manager 720. The database 710 is used to store the data (e.g., statistics) received from TMS Statistics Collection Servers 620 (or other TMS Statistics Repositories if the TMS Statistics Repositories are deployed in a hierarchical arrangement), and the database manager 720 provides a mechanism for accessing and processing the stored data. The database manager 720 and database 710 can be implemented using any commercially available database system that can handle the volume of data (e.g., Oracle Database Server). Many database managers already have the ability to accept data over a network connection, format the data into database entries, and insert it into the database. If the chosen database manager does not have these abilities, a network server application can be constructed by any programmer skilled in the art of network programming and database usage to listen to a socket, receive data in formatted packets, reformat the data into the database entry in use, and insert the data into the database using the database manager. A record within the database 710 can take the form of a time-stamped version of the NetFlow record, as shown in Table 1 above. In the preferred embodiment, the record shown in Table 1 is extended with fields listing the predicted number of packets and predicted bandwidth required by the flow for the next 5 ΔT time periods. Once the data is stored in the TMS Statistics Repository  610, it can be further analyzed. For example, the data stored in the TMS Statistics Repository 610 can be used as input to the TMS Algorithm 200 shown in FIG. 2. It should be noted that the statistics collection functionality described here can be used alone or in combination with the embodiments described above for automatically directing data in response to traffic demands and with the embodiments described later in this document. If the TMS Algorithm or other type of automatically directing data system is used, it might be preferred to design the TMS Statistics Repository 610 to be fault tolerant. In this way, the failure of a single TMS Statistics Repository would not prevent the real-time provisioning. The TMS Statistics Repository can be made fault tolerant by a mechanism such as having the database managers replicate the database between multiple individual TMS Statistics Repositories. This is a standard feature on commercially available database managers. Turning again to the drawings, FIG. 8 is block diagram of a TMS Statistics Collection Server  800 of a preferred embodiment that illustrates this functionality. As shown in FIG. 8, the TMS Statistics Collection Server 800 comprises classification schema 810, network topology information 820, a plurality of protocol-specific modules 830, and a statistics engine 840. The classification schema 810 describes the information that the TMS Statistics Collection Server 800 should attempt to collect from each of the network elements listed in the network topology information 820. For each network element, the relevant portion of the classification schema 810 is provided to the appropriate protocol-specific module 830, which then communicates this information to the actual network element. The network topology information 820 allows the TMS Statistics Collection Server 800 to know where to go to collect the desired information. The network topology information 820 preferably comprises (1) a list of network elements from which a given TMS Statistics Collection Server should collect information, (2) information identifying the type of equipment (i.e., vendor and product ID) comprising each network element, and (3) information indicating how communication should take place with that network element. The protocol-specific modules  830 (which can be vendor-specific and/or equipment-specific) know how to communicate with multiple types of network devices or multiple instances of a network device and gather desired traffic information. The protocol-specific modules translate a generic request into a specific form that will be understood by the network element. If the network element cannot respond to the request directly, the protocol-specific module preferably collects information that it can get from the network element and tries to synthesize an answer to the request that was described in the classification schema 810. In one preferred embodiment, the protocol-specific modules 830 are responsible for (1) configuring network elements to collect network statistics (this can include instructing the network elements to perform filtering on the data that they collect so that only essential data is returned to the TMS Statistics Collection Server); (2) collecting network statistics for each network element; (3) filtering the network statistics provided by each network element (in some cases, the network elements themselves may be capable of filtering the data that they present to the TMS Statistics Collection Server so that the TMS Statistics Collection Server does not need to perform any filtering functions itself); and (4) converting the statistics to a common format understood by the overall network statistics collection system. The Statistics Engine 840 aggregates the network statistics received from each of the vendor-specific modules and then transmits them to a TMS Statistics Repository (if used) for storage and processing. The TMS Statistics Collection Server 800 can also perform live packet capture, distill this information, convert it into a common format, and then transmit it to a TMS Statistics Repository. As a result of processing the classification schema for R 1, the TMS Statistics Collection Server sends one or more directives/rules to router R1. Each directive is preferably comprised of an Information Request Record and an IP Flow Description Record. The IP Flow Description Record can also be combined with one or more transport-layer flow description records, for example, a TCP flow description record or a UDP flow description record. Turning again to the drawings, FIG. 9 shows the components of a TMS Signaling System  900 of a preferred embodiment. As shown in FIG. 9, this preferred TMS Signaling System 900 comprises a reconfiguration module 910, a state transition checker 920, and a signaling distribution module 930. In operation, the reconfiguration module 910 creates a series of network transformation instructions. As used herein, the term “network transformation instruction” is intended broadly to refer to any instruction that can be used to configure or reconfigure one or more network elements in a computer network to create a network configuration. Examples of network transformation instructions include, but are not limited to, instructions to establish a link, circuit, or path between nodes and instructions to tear down a link, circuit, or path. In FIG. 9, the reconfiguration module  910 combines the network topology information 940 with the output of the TMS Algorithm 950 to create a configuration for each of the network elements represented in the network topology. 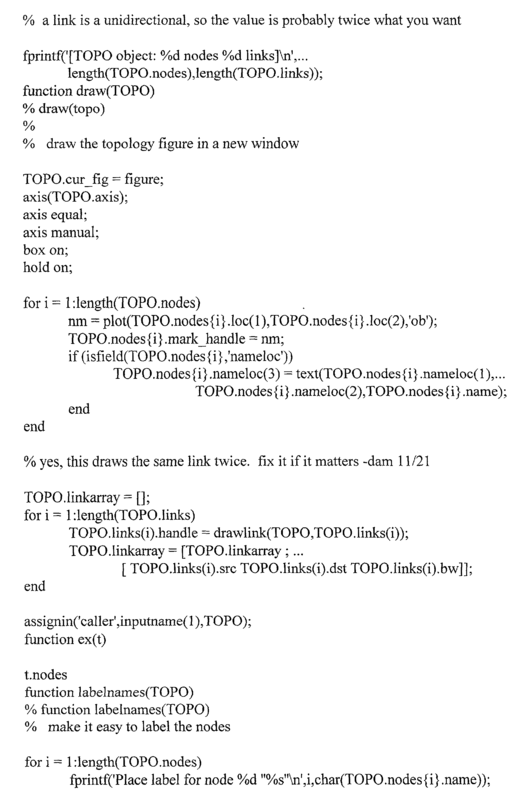 This topology is described in a common format used by the system. The configuration is preferably not converted to equipment/vendor-specific configurations until after the configuration is processed by the state transition checker 920. An acceptable common format for the system is the complete set of Command Language Interface (CLI) commands defined by a common router vendor, such as the Cisco CLI. The network topology can be determined by any number of methods. For example, the network operator can run a routing protocol such as OSPF or ISIS (possibly with Traffic Engineering (TE) extensions). The network operator can also assemble the configured files for each of the IP routers in the network and using the information contained therein to construct a graph of the network topology. The state transition checker  920 determines whether the series of network transformation instructions is valid (e.g, that the state transitions induced by a network configuration or reconfiguration do not result in intermediate states that prevent later states from being reached). In this way, the state transition checker 920 acts as a “sanity check” to make sure that everything happens in an orderly fashion. When reviewing a network configuration, the state transition checker 920 ensures that the order in which network elements are configured does not create undesirable intermediate states in the network. For example, when reconfiguring an optical cross-connect, it might be possible to partition a portion of the network from the TMS Signaling System 900 if network element configurations are executed in the wrong order. The state transition checker 920 orders the configuration steps to ensure that the network configuration can be implemented completely and without destabilizing the network. The state transition checker 920 can be implemented as a network simulator that establishes an ordering for the network element re/configuration instructions and then simulates the behavior of each of these instructions to ensure correctness and stability. 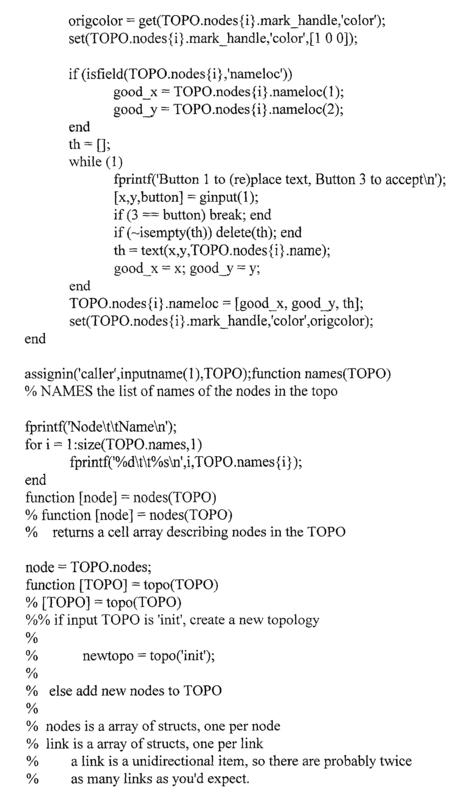 The initial ordering for the reconfiguration instructions is the order that results from the execution of the TMS algorithm as described above. If this ordering is found to cause incorrectness or instability, the order is permuted so that the failing step is placed first. 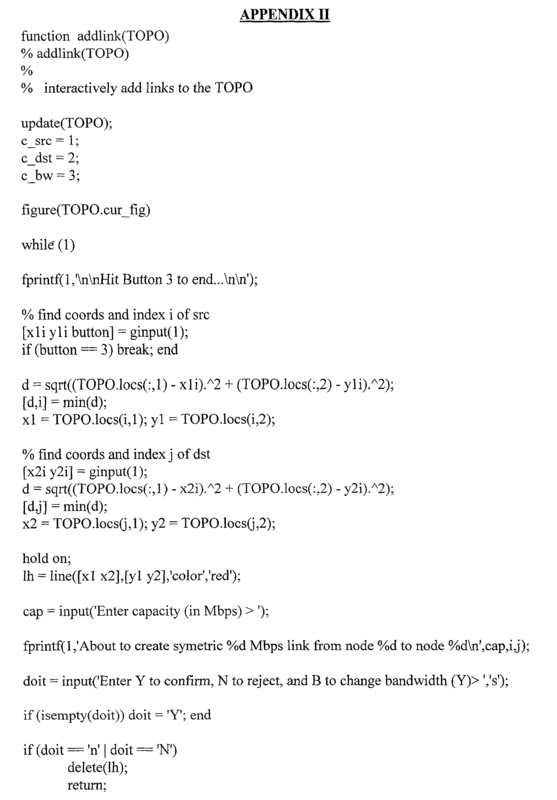 Several iterations of this method will typically result in an acceptable order. Examples of suitable network simulators include the NetMaker product from Make Systems and the simulator described in “IP Network Configuration for Traffic Engineering” by Anja Feldman and Jennifer Rexford, ATT TR-000526-02, May 2000, which is hereby incorporated by reference. When the state transition checker  920 verifies a valid series of instruction, the instructions are sent to the signaling distribution module 930. The signaling distribution module 930 is responsible for ensuring that each of the network elements is properly configured. In operation, the distribution module 930 distributes the configuration information to the local TMS Signaling Servers in the order determined by the state transition checker 920. If the signaling distribution module 930 communicates directly with each of the network elements, the protocol-specific modules described above can be implemented to convert the description of the configuration produced by the reconfiguration module 910 into specific instructions that are understood by each of the network elements. Alternatively and preferably, the signaling distribution system 930 can send the configuration for each network element to the appropriate TMS Signaling Server, such as the TMS Signaling Server 1000 shown in FIG. 10. The protocol-specific modules 1010 on the TMS Signaling Server 1000 can then convert the generic configuration information into the appropriate commands that are understood by each network element. (b) automatically directing data in the computer network based on the determined traffic demands. 2. The invention of claim 1, wherein (a) comprises determining traffic demands of a computer network at least in part from traffic data from a plurality of network elements in the computer network. 3. The invention of claim 1, wherein (a) comprises determining traffic demands of a computer network at least in part from traffic predictions. 4. The invention of claim 1, wherein (a) comprises determining traffic demands of a computer network at least in part from a request. 5. The invention of claim 4, wherein the request is expressed in term s of one or more of the following: bandwidth, latency, jitter, loss rate, protection type, and burst size. 6. The invention of claim 4, wherein the request is expressed using RSVP. 7. The invention of claim 4, wherein the request is expressed using RSVP-TE. 8. The invention of claim 4, wherein the request is expressed using a user-to network interface. 9. The invention of claim 4, wherein the request expresses a service level agreement that allows a customer to reserve a private path. 10. The invention of claim 9, wherein the request expresses a service level agreement that allows a customer to reserve a protection path in addition to the private path. 11. The invention of claim 1, wherein (a) comprises determining traffic demands of a computer network at least in part from a policy system. 12. The invention of claim 11, wherein the policy system comprises a policy expressed in terms of one or more of the following: bandwidth, latency, jitter, loss rate, protection type, and burst size. 13. The invention of claim 11, wherein the policy system is implemented using COPS. 14. The invention of claim 11, wherein the policy system expresses a service level agreement that allows a customer to reserve a private path. 15. The invention of claim 14, wherein the policy system expresses a service level agreement that allows a customer to reserve a protection path in addition to the private path. 16. The invention of claim 1, wherein (a) comprises determining traffic demands of a computer network at least in part from at least two of the following: traffic data from a plurality of network elements, traffic predictions, a request, and a policy system. 17. The invention of claim 1, wherein (a) and (b) are repeated periodically. 18. The invention of claim 1, wherein (a) and (b) are repeated in response to an event. 19. The invention of claim 18, wherein the event comprises receipt of a service level agreement. 20. The invention of claim 18, wherein the event comprises a change in traffic demand. 21. The invention of claim 1, wherein (b) comprises automatically directing data through a set of primary paths in the computer network. 22. The invention of claim 21 further comprising providing a set of protection paths for the data. 23. The invention of claim 22, wherein (b) comprises automatically directing data simultaneously over both the set of primary paths and the set of protection paths. 24. The invention of claim 22, wherein (b) comprises automatically directing data over the set of protection paths only if a failure occurs on the set of primary paths. 25. The invention of claim 22, wherein the set of primary paths comprises N primary paths and wherein the set of protection paths comprises M protection paths. 26. The invention of claim 25, wherein (b) comprises automatically directing data over one of the M protection paths only if a failure occurs on one of the N primary paths. 27. The invention of claim 1, wherein (b) comprises automatically directing data through at least one network element in the computer network. 28. The invention of claim 27, wherein the at least one network element comprises a photonic switch. 29. The invention of claim 28, wherein the photonic switch comprises a fiber-to-fiber switch. 30. The invention of claim 28, wherein the photonic switch comprises a waveband-to-waveband switch. 31. The invention of claim 28, wherein the photonic switch comprises a wavelength-to-wavelength switch. 32. The invention of claim 27, wherein the at least one network element comprises an electronic switch. 33. The invention of claim 32, wherein the electronic switch is operative to switch data from any wavelength on any incoming fiber to any wavelength on any outgoing fiber. 34. The invention of claim 27, wherein the at least one network element comprises a label switched router. 35. The invention of claim 34, wherein the label switched router implements multi-protocol label switching. 36. The invention of claim 27, wherein the at least one network element comprises an optical packet switch. 37. The invention of claim 27, wherein the at least one network element comprises an optical burst switch. 38. The invention of claim 27, wherein the at least one network element comprises a SONET ADM.
39. The invention of claim 1, wherein (b) comprises automatically directing data in the computer network by provisioning at least one of the following: a label switched path, a routing metric, a time slot, a fiber, and a wavelength. 40. The invention of claim 39, wherein (b) comprises automatically directing data in the computer network by provisioning at least one of a label switched path, a routing metric, a time slot, a fiber, and a wavelength in a plurality of network elements, thereby forming a path through the computer network. 41. The invention of claim 1, wherein (b) comprises automatically directing data in the computer network by setting at least one of a cost or a preference metric used by a routing protocol. 42. The invention of claim 1, wherein (b) comprises load balancing the data across multiple paths in the computer network. 43. The invention of claim 1, wherein (b) comprises minimizing an intervention of electrical devices when routing wavelengths either individually or in groups. 44. The invention of claim 1, wherein (b) comprises configuring a path in the computer network. 45. The invention of claim 1, wherein (b) comprises reconfiguring a path in the computer network. 47. The invention of claim 1, wherein the computer network comprises at least one of a service provider's core network and a service provider's access network. 48. The invention of claim 1, wherein the traffic demands are expressed in terms of one or more of the following: bandwidth, latency, jitter, loss rate, protection type, and burst size. a processor operative to determine traffic demands of the computer network and operative to automatically direct data in the computer network based on the determined traffic demands. 50. 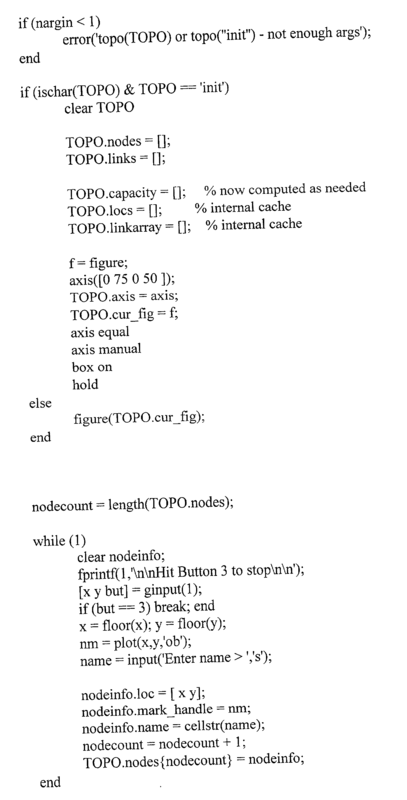 The invention of claim 49, wherein the processor is operative to determine traffic demands of the computer network at least in part from traffic data collected from the plurality of network elements. 51. The invention of claim 49, wherein the processor is operative to determine traffic demands of the computer network at least in part from traffic predictions. 52. The invention of claim 49, wherein the processor is operative to determine traffic demands of the computer network at least in part from a request. 53. The invention of claim 49, wherein the processor is operative to determine traffic demands of the computer network at least in part from a policy system. a second processor operative to determine traffic demands of the computer network based on the collected traffic data and operative to automatically direct data in the computer network based on the determined traffic demands. 55. The invention of claim 54, wherein the second processor is operative to determine traffic demands of the computer network at least in part from traffic data collected from the plurality of network elements. 56. The invention of claim 54, wherein the second processor is operative to determine traffic demands of the computer network at least in part from traffic predictions. 57. The invention of claim 54, wherein the second processor automatically directs data in the computer network by sending a plurality of network transformation instructions to a third processor, and wherein the third processor determines which of the plurality of network transformation instructions to send to each of the network elements. 58. The invention of claim 57, wherein the third processor is further operative to arrange the plurality of network transformation instructions in an order that will not result in an invalid network state when implemented. 59. The invention of claim 57, wherein the third processor is further operative to convert a selected network transformation instruction into a form appropriate for a selected network element. 60. The invention of claim 57, wherein the third processor is operative to send a selected network transformation instruction to the first processor for transmission to a selected network element, and wherein the first processor is further operative to convert the selected network transformation instruction into a form appropriate for the selected network element. means for automatically directing data in the computer network based on the determined traffic demands.